ARMFORCE Arm Sleeves – The most versatile and ideal for training in the autumn, winter and spring and for the occasional or regular sports person. The inside part of your armsleeve has a specific, more aerated woven structure to allow air to circulate freely, to ensure maximum ventilation and to wick moisture away instantly. The 360° seamless compression around the arm absorbs the “shockwave” effect on muscles, veins and joints. Less vibrations means delayed muscle fatigue. Your resistance to prolonged exertion is enhanced! The graduated compression acts on both muscular zones of your arm. Improved venous return and shock absorption is guaranteed along the entire arm length. During exercise, the stimulation of blood flow increases oxygenation to the muscles. Your arms feel lighter and less strained. 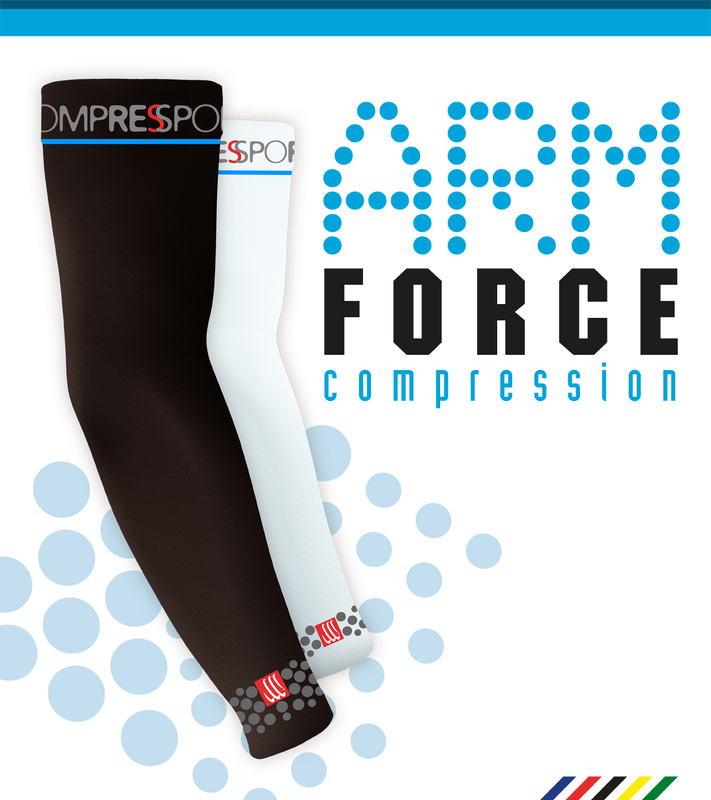 Your COMPRESSPORT® ArmForce Armsleeves do not retain water and will remain feather light in all conditions. During normal use, your Armsleeves are tear-proof. The special knitting protects you from the cold and windchill whilst still providing maximum breathability for your skin. The activation of microcirculation assists and supports the skin’s thermo-regulating mechanism, therefore allowing you to save energy. 100% seamless, your COMPRESSPORT® ArmForce Armsleeves are knitted to fit every curve of your arms perfectly, maximising their efficiency and comfort (no chafing). As true moisture absorbers, they allow sweat to dry instantly and you can swipe the perspiration of your face with the back of the hand. The Dots do not retain water and the air that flows between them allows ultra fast drying! 100% hygienic. The SANITIZED® treatment helps to prevent the growth of bacteria and naturally fights odours. It ensures a feeling of freshness all day long.